We're seeing an increasing number of innovative systems proposed to power large road vehicles electrically. ABB recently unveiled a quick charging system for buses, Siemens have offered a system for trucks based on overhead wires while KAIST and Bombardier are testing wireless solutions. By running electrically-charged power lines through long stretches of highway roads, Volvo hopes to offer long-haul truckers electric vehicles that don’t have to stop to re-charge. “In city traffic, there are currently various solutions and we are researching many others. We have field tests in progress where our plug-in buses are equipped with a battery that can be charged quickly when the buses are at bus stops,” says Mats Alaküla, the Volvo Group’s expert on electric vehicles and Professor at Lund University. But for long-distance trucks and buses, this will not work. They stop infrequently and to cope with this task they would need so many batteries that there would be no room for any loads or passengers. A solution is required where power is continuously supplied to the truck from an external source. The Volvo Group participates in a large Swedish research project to find solutions for this, with the support of the Swedish Energy Agency. The project includes the Swedish Transport Administration, Vattenfall, several universities, vehicle manufacturers and suppliers. 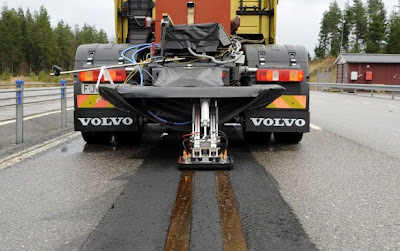 The method currently being developed and tested by the Volvo Group, together with Alstom, entails two power lines built into the surface of the road along the entire length of the road. A current collector in contact with the power lines will be located on the truck. Last year, Volvo built a 400-meter long track at its testing facility in Hällered outside Gothenburg. The company has been testing the system since last autumn. “We are currently testing how to connect the electricity from the road to the truck. The electricity flows into a water-cooled heating element, with similar power requirement as an electricity-driven truck,” says Richard Sebestyen, who is the project manager at Volvo Group Trucks Technology, which is the Volvo Group’s research and development division. However, a great deal of research still remains before this can become a reality. It involves the continued technical development of the current collector, electric motor and the control systems required. It also involves road construction, road maintenance, electricity supply along the roads and various payment models, etc. “A lot of years remain before this is on our roads,” says Mats Alaküla.